Ok everyone, you've got one final weekend to try Dairy Queen's blizzard of the month. 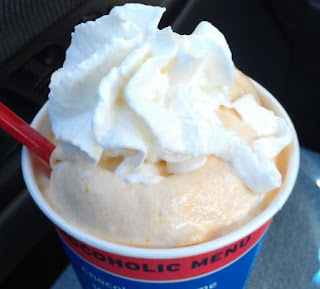 The oh so tasty Pumpkin Pie Blizzard is like a half frozen pumpkin pie just waiting to be eaten. What, you don't believe me? Well how about Rodzilla? or 2 girls? or IndianapolisEater? no wait, IE got himself a junky flavorless one... how does that happen? For me, this year's blizzard was even stronger than last year's blizzard. Where's the quality control people? Have a good weekend everybody, I'm off to brace for more snow, oh boy! We are expecting snow here in MD as well; make it stop! At least I have ice cream in the freezer. I also got a flavorless one and I've never received or been asked if I wanted whipped cream on a blizzard. I'm feeling jipped! Mmmm this looks amazingly good!